A dazzling display of Lenox crystal craftsmanship. Light dances on crystal like fire and creates a radiant display. 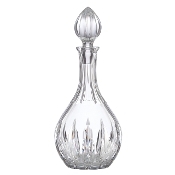 This elegant Firelight crystal decanter will bring that sparkle to any home bar or table. The delicately cut stopper continues the beautiful lines of this spectacular decanter. Easy to use. Top of glass detachable for easy cleaning. FDA Approved, Food Safe. Hand wash only. The Franmara Decanter Drying Stem makes cleaning and drying your wine glassware so easy and convenient. The drying stem is nickel plated with a white silicone cap allowing you to dry all glassware safely and without any damage to the decanter. The Decantus Aero Wine Aerating Pourer utilizes the Bernoulli effect where reduced pressure of wine draws an air flow through diagonal thin tubes inside the Decantus enhancing the flavor. 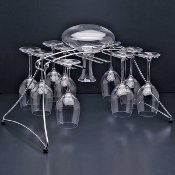 Our Fusion Stemware rack safely holds 16 glasses and features a center ring for drying your decanter. Striking design and functionality make this the perfect tool to aid in cleaning up after a dinner party or wine tasting. 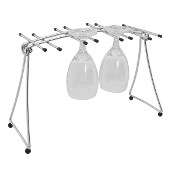 A smaller version of the Fusion 16, the Fusion 8 Stemware Rack offers a more compact drying rack for the space-conscious wine consumer. Rabbit Aerating Wine Pourer // Metrokane, founded in 1983, produces the world's leading line of wine accessories, including the famous Rabbit corkscrew, and continues to develop a host of fresh and innovative... New from Old Dutch International - For trend setting serve ware worthy of the finest table look no further than this elegant chafing dish. the hand-hammered bright copper finish and black iron stand elevate your gourmet fare to a new level. 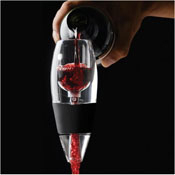 The Vinturi Deluxe Aerator Set in black creates a dramatic presentation for conveniently aerating your wine. The contemporary design complements Vinturi and accents any table, countertop, or bar. Innovative two piece design is easy to store and clean. 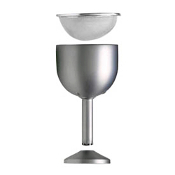 The Vinturi Deluxe White Wine Aerator Set creates a dramatic presentation for conveniently aerating your wine. 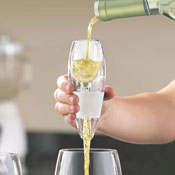 White Wine Displays the same benefits from proper aeration as traditional red wine decanting. Travel in style and taste with the new Vinturi Travel, a compact portable version of the award-winning Vinturi Essential Wine Aerator. Small yet fully functional, the Vinturi Travel is packed in a sleek and sturdy tapered black case The Decantus Classic Wine Aerating System causes undesirable smells to dissipate more effectively, making the aroma more complex and the taste softer and less bitter. 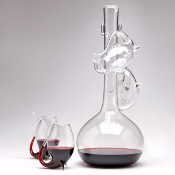 The Decantus Connoisseur Wine Aerator Set was designed in the shape of the classic amphora vase used by the ancient Greeks and Romans to carry and store wine over 3,000 years ago! A must-have for any wine enthusiastic. The Decantus To-Go Wine Aerator is great to take to a wine party. After wine is poured through the Decantus, undesirable smells will dissipate more effectively, the aroma becomes more complex and the taste becomes softer and less bitter. 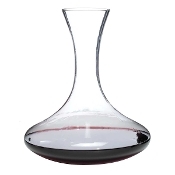 The Vantage Wine Decanter is the plastic practical way to decant and serve wine in a clear decanter without worry about breakage.